Unable to find any original printed information regarding mixer repair, we developed the following diagrams, instructions, and photos. They were created for the use of our individual customers and are not to be reprinted or reproduced for distribution, without the written permission of the developer. if they solve your problems. We would also like to learn your tricks or cures. NOTE: I learned a couple of things from the You Tube video, "Hamilton Beach Model 30 Malt Mixer service", which I highly recommend. It was posted by Vintage Mixers and More. You can check out Vintage Mixers and More on Facebook. These diagrams and instructions work for us, but we cannot guarantee your success in using them. The content is general in nature and must be used with an appreciation for the differing capabilities among individual visitors. We recommend that you consult with a licensed repair professional before undertaking any of the suggestions below. Malt Mixer Man does not warrant that the content of the following documents will meet your requirements. We are not responsible for accidents, improper installation, or your failure to correctly follow the directions. Using proper safety devices, such as wearing eye protection, disconnecting power sources, and conforming to Federal, State and Local Government Safety Standards and all Industry Safety Standards, is the responsibility of the user. By using the following, you agree to indemnify and hold harmless Malt Mixer Man from and against any liability, loss, injury, or claims which arise from the use of the diagrams or procedures on this website. If you don't find the solution to your problem in this section, check the Q & A section on this website for possible answers. Unplug the machine before beginning any work. These instructions will assume that you're starting from scratch and have never installed a micro-switch, bearings, brushes, etc. 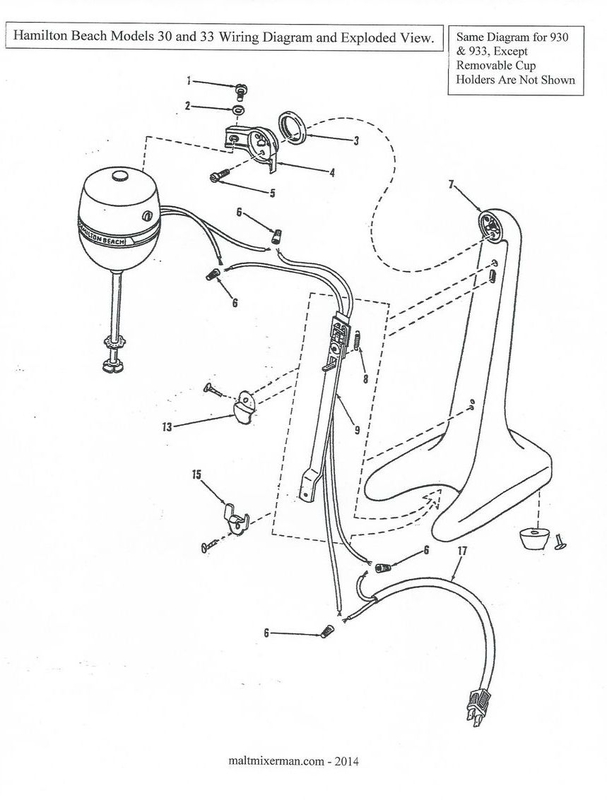 These basic instructions will be good to assist you as you disassemble your mixer, as well as put it back together, by following the directions backwards. While you're inside you will have access to your bearings, brushes, and switches, so that you can also give your mixer a general cleaning. If you run into problems, you can contact our service department here, and we will walk you through the job. 1. Remove the three black 3-speed knobs on top of the mixer. have to use your hand to tap the cover above the chrome ring). Once it’s loose, lift off the top half of the head cover. 3. Disconnect the three wires going to the manifold terminals, which are connected to the chrome ring. Remove three hex nuts holding the 3-speed switches to the chrome ring, and push switches down and out of ring. chrome ring. Lift off ring and set aside. switch. This odd wire comes up from the cup-activated switch at the bottom of the mixer. Do this on all 3 motors. The odd wire is opposite of the three wires that are on one side of the switch. NOTE: Do not remove these three wires unless you are changing out a 3-speed switch. 6. Remove the 4 long screw bolts that hold each motor, then lift out each motor. usually the one that has been used the most. The left motor generally has not been used as much. NOTE: You can remove the lower part of the head by taking out the four allen screws. However, this is not necessary. BUT it’s almost impossible to get the switches out (see step 9) without removing the lower part of the head from the base. If you are doing restoration and other work on your mixer, you will need to remove the four allen screws. 7. Remove back mixer cover by removing the six screws. This will give you access to your lower switches. directly up to the bottom of the chrome ring manifold. activated switch inside the machine. "Replacing a Cup Switch With a Micro-Switch Kit" describing how to change bearings and replace switches with micro-switch kits. Follow the detailed "Disassembling a Three Head Mixer" instructions on this page) and remove the motors from the mixer base. 1. After removing a motor from the base, unscrew the bolts on the clips on each side of the motor that hold the brushes. The brush holders are black and stick out like ears from the motor. Remove the brushes and springs from the holders. Scratch numbers on the motors, which helps during reassembly and rotation of the motors. 4. Lift off the top half of the motor. 5. Lift the coil and attached 3-speed switch up off of the armature. pressed on. Set it aside, as it will be reused on reassembly. and shaft fan are centered and not directly over one of the blocks. Press down on the mixing blade end of the shaft. This will free the bearings and shaft from the bottom housing and allow access for bearing removal. NOTE: The bearings on the older machines will be an open bearing and the newer machines have an enclosed bearing. Our replacement bearings are all enclosed. It is very important before removing the old bearings to measure and mark their exact placement on the shaft to be able to place the new bearings in the same location. Too high or two low on the shaft will result in the brushes not running properly on the armature. 9. The bearings can either be pressed off with the press or be removed with a bearing puller at this time. 10. Replace bearing and reassemble the motor in reverse order. The cup switches in these mixers were probably the weakest link in these heavy-duty mixers. Rather than trying to repair the internal mechanisms of malfunctioning cup switches, Hamilton Beach developed the micro-switch kit with which to replace the cup switches. Approximately 25 percent of the triple head mixers you see today will most likely have one or more of these micro-switch kits already installed. Our micro-switch kits, which are duplicates of the originals, come complete with pigtails and attaching screws for easy installation. Before starting, refer to the detailed Disassembling a Three-Head Mixer instructions on this page. It is impossible to install a micro switch without removing the old cup switch from the base. Using an oversize drill bit, remove only the outer heads of the rivets. CAUTION: Do NOT enlarge the holes holding the rivets, you will be using the frame later to hold the micro-switch kit. Using a screwdriver, you can easily pop the headless rivets and the rest of the switch mechanism out of the frame. 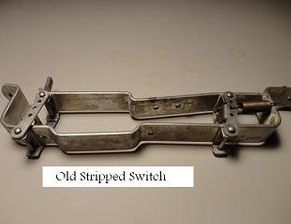 Figure 2 shows the stripped switch frame after the internal mechanism has been removed. The cup switch can be installed in the same manner in either the 40DM or the 940. 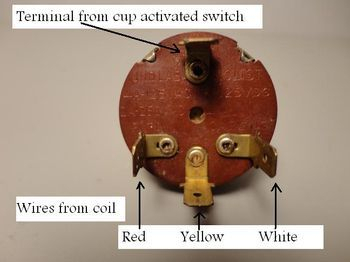 Figure 4 shows the micro-switch after installing it in the old frame. Remove the two loosely attached screws from the new holder. Place the micro-switch kit in the old frame and install the two screws through the rivet holes in the frame. Tighten screws down to the metal micro-switch holder. NOTE: I would suggest that you adjust your switch at this time, rather than waiting until it is in the mixer. The adjusting bolt sits in a slot in the new holder. It must be situated so that the switch will activate when sliding the mixing cup up. Use the adjusting bolt on the micro-switch to secure it in the proper position. If one is available, use a continuity tester to achieve the proper placement of the switch. If not, slowly slide the movable part of the old frame up about 1/8th of an inch until you hear the micro-switch make a small click. If you do not hear the click, move the activator lever on the micro-switch either closer or farther away from the frame. Tighten down the two bolts on the micro-switch to keep the activator lever in the proper position. 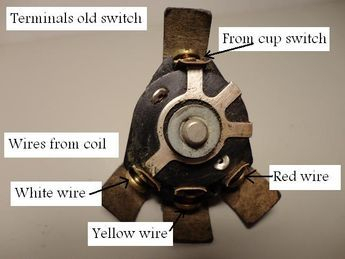 Up until now, there has been no way to repair an old three-speed switch, other than to wire it directly to just one speed. This new three-speed switch and kit will replace the original three-speed switch on all 40DM and 940 triple head Hamilton Beach mixers. No modifications are required, other than changing the terminal heads on four wires from a Y connector to a push on connector. The new switch attaches in the same manner to the chrome ring as the original. 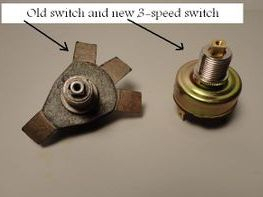 The black three-speed knob can be reused with the new switch. 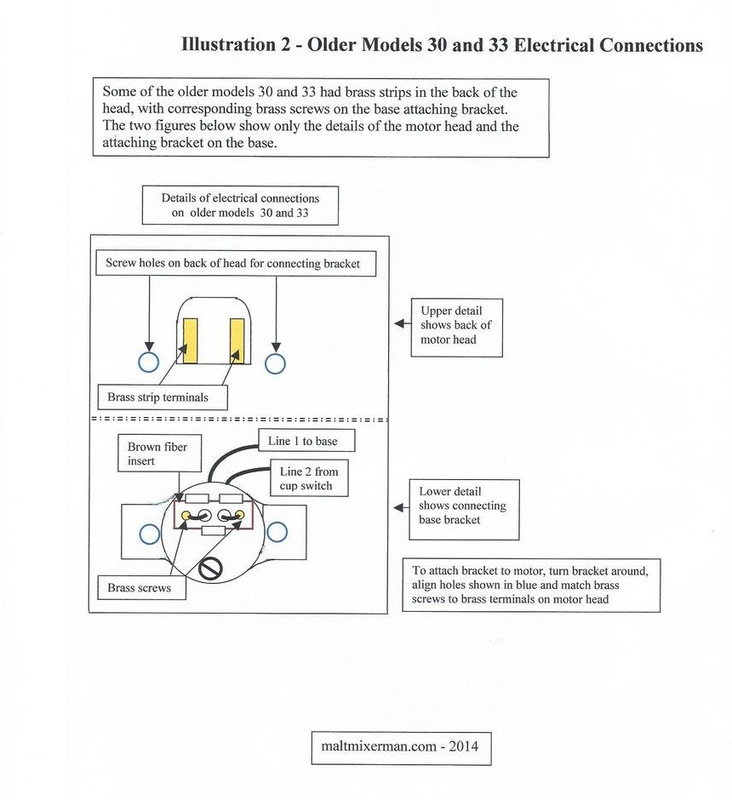 Follow the detailed "Disassembling a Three Head Mixer" instructions on this page to the point of removing the chrome ring. This gives you access to the three-speed switches on the motors. Disconnect four wires leading to the bad switch. Three are attached to the coil on the motor, and the fourth leads from the cup activation switch. kit to change 6, but only 4 are needed. 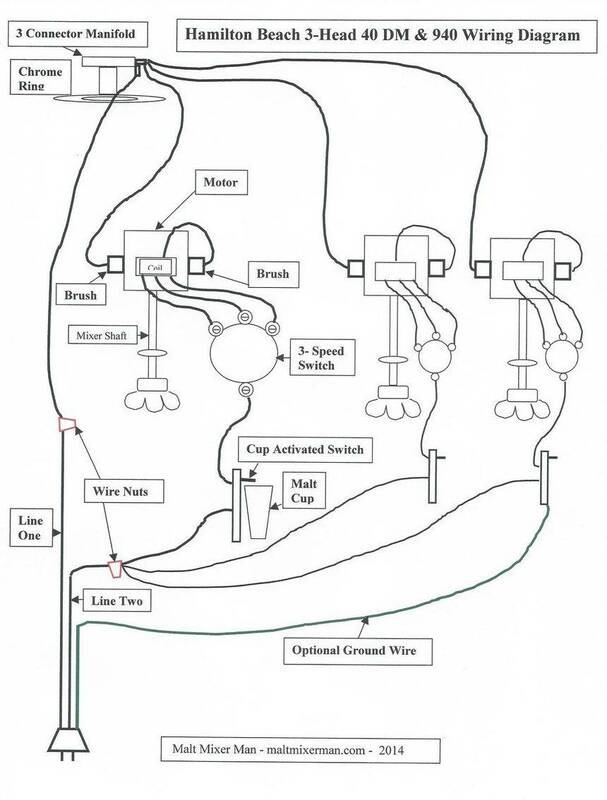 Using Figure 4 as a guide, attach the terminals to the three wires from the coil and to the wire attached to the cup switch. The terminals can be either soldered or crimped. 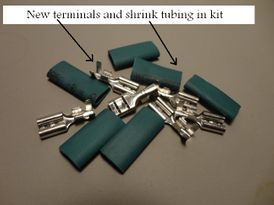 Shrink tubing is included in the kit to help insulate the terminals. Figure 5 shows the positions of the four wires on the old switch. Connect the terminals to the new switch in the order shown in Figure 6. NOTE: The position of the red and white wires are in reverse order from the old switch. It is important to change the order, as the location of the wires determine the high, medium, and low speeds. Sometimes it is impossible to tell what color the wires are. When that happens, you have to use trial and error. Choose a post on the bottom of the switch that matches the high, medium, and low stations on the pointer of the black knob on top of the mixer. Do NOT change the wire to the post (the single one opposite of the three posts) that comes up from the cup switch, as that is the power feed to the switch. Replace the switch in the chrome ring and reassemble the machine. As the general principles apply to all mixers, see "How to Diagnose a Brush Problem" under the Models 30, 33, 930, and 933 section below. 1. In order to locate and access the brushes, follow steps 1 and 2 of "Disassembling the Three-head Malt Machine" on this page. 2. Locate the two black brush holders on the sides of each motor, as shown on the "Simple Wiring Diagram for a Three-Head Mixer" on this page. 3. Unscrew and remove the metal retaining clip to check condition of brushes and springs. 4. Replace brushes and proper springs if necessary. starting" a mixing shaft by giving it a spin after turning the motor on can cause serious damage to the armature. If you have the motor separated, you have access to the top bearing. Normally this bearing does not need to be changed, as it has very little side pressure. Check to see if it is dry, and if so, lubricate it with a light grease. If you run it and it still makes noise, you should change it out. You can remove it using a bearing puller. 1. Unscrew and remove the mixing blade from the end of the shaft. This is easily accomplished by using two pairs of pliers, rather than using a screwdriver. 2. Tap down on the slinger ring, the flat disk that sits about one inch above the mixing blade, as it is just pressed on. 3. Unscrew the 3 screws from the inside of the bottom motor housing and remover the top housing ring. 4. Unscrew the other 3 screws from the cover of the dust shield inside the bottom housing. This dust shield will come out with the shaft when the shaft is removed. The only thing holding the armature from separating from the bottom housing now is the splash ring that sits directly against the lower housing on the outside. The splash ring is pressed on, and the easy way to remove it is to press it off. (Using a bearing puller will usually do more harm than good.) A small press is best, but if one is not available, a drill press will work most of the time. 1. Turn the bottom motor housing upside down and place the edges on a couple of wood blocks. Note: The armature is much wider than the shaft, so be sure to have the blocks far enough away from the shaft to allow the armature to come down without damaging it. 2. Press down on the end of the shaft and the ring will usually come off quite easily, freeing the armature from the housing. It is very important before removing the two old bearings to measure and mark their exact placement on the shaft to be able to place the new bearings in the same location. Too high or too low on the shaft, and the brushes will not run in the right place on the armature. The switch is usually not the culprit when the mixer does not work, but it usually gets the blame. The only thing the switch controls is the two mixing speeds. Occasionally the two-speed switch will not change from hi to lo. This is a common occurrence from using the same speed for too long a time, or from not using the mixer over long periods of time. You have to remember that some of these machines are more than eighty years old. Models 18, 30, 930, 33, and 933 have two-speed switches. Older models ran on only one speed. 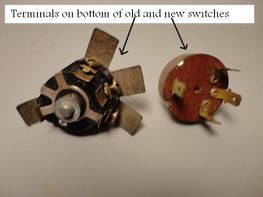 Because of the location, these switches may have collected malt, dirt, and gunk in the internal mechanism, causing it to be stuck in one speed. After locating the switch on the top back of the mixer head, place a few drops of denatured alcohol or WD-40 around the toggle on the switch, so that it runs down inside the switch. Vigorously work the toggle back and forth from high to low several times. If it is still sticky, repeat with the alcohol or WD-40. This will usually take care of the problem. If not, you may have to replace the switch. If the mixing shaft turns freely by hand and the mixer won't run or has no power, the first thing to look at is the brushes. There can be other things wrong, such as the cord or switch, but 75% of the time the brushes are the problem. They are very simple to check and change and the best insurance you can provide for your mixer. NOTE: If the mixing shaft does not turn easily, that usually indicates a dry or "frozen" bearing. If that is the case, see "Changing and/or Lubricating Bearings" above. The first and most common problem is worn down brushes. Normally, if a brush has only 1/8" remaining, it is time to replace them. If they get much shorter than that, they can start arcing from the brush springs to the armature and cause serious problems. Changing brushes is not something that you have to do every year. A new set of brushes is usually once-in -a- lifetime task for the homeowner and about 15 to 20 years for a shop. It is not unusual to see mixers made in the 40's that still have the original brushes in them. The second problem that you have to consider is weak springs. It is important for the springs to maintain a constant pressure on the brush to keep it tight against the armature. Some of these springs have been under pressure for more than 80 years and have lost a lot of their compression strength. When changing brushes make sure to also replace the springs with the new proper springs. The third problem that can occur, and usually the hardest to diagnose, is carbon build-up on the inside of the brass brush canal (brush holder). This is the small brass rectangle liner inside the head that the brush and spring slide into. Sometimes, if the brushes have been neglected and have almost worn down completely, or if the springs are weak, arcing can cause carbon build up inside of the canal near the armature. If there is carbon build up, the brush will not slide in easily and will not put enough pressure on the armature. This can usually be heard as a crackling noise, as the brushes cannot get past the carbon build-up and are arcing across the small gap. The crackling noise is not to be confused with the small cracking noise that new brushes will usually make as they "run in". This sound will go away after they conform to the diameter of the armature, which may have worn down over years of use. These are problems that you will run into in about any make of malt mixer. In some of the different brands, one or more of the three problems will occur more often. For some unknown reason the Myers mixers tend to have the third problem much more than the first two. Hamilton Beach mixers seem to have problems one and two but rarely number three. "Changing or Lubricating Bearings" in another document on this page. armature to give good electrical contact, which results in the motor slowing down, or in some cases not running at all. 4. Attach the new brush to the end of a new spring, insert brush-end first into the mixer head and replace the brush cap. recommended and usually all that is necessary.